As effective as influencer marketing may be, marketers face several challenges when trying to build a compelling influencer marketing campaign. Some may be facing budget constraints preventing them from pulling off the kind of campaign they had been hoping for. Others may find it a bit difficult to find the right influencers and connect with them. But the good news is that there are plenty of useful social media marketing tools and an influencer marketing platform to make your job easier. In this post, you’ll discover the best tips, tools, and templates that will assist you in your influencer outreach campaign. First, you’ll learn about the best practices to follow when reaching out to influencers. Then you’ll get recommendations for some of the most useful influencer marketing platform and social media marketing tools. To make things even easier for you, you’ll get a few sample templates that you can use when sending out your outreach emails to influencers. The influencer outreach stage is one of the most difficult parts of an influencer marketing campaign. This is where you identify and reach out to potential influencers, seeking their help to promote your brand and product. If you don’t do it right, you’ll be losing out on a chance to work with people who have the maximum impact on your audience’s purchase decisions. First of all, you will need to establish a connection with influencers who have the right kind of impact on your target audience. It doesn’t matter if you use the best influencer marketing platform in the world or if you employ the best email marketing tactics to craft your outreach emails. If you’re not reaching out to the right influencers, your influencer marketing campaign will not work. Later on you’ll learn about the best social media marketing tools to help you identify potential social media influencers for your brand. For now, you need to first understand the characteristics you’ll need to consider in an influencer before deciding to reach out to them. In order to do this, you’ll need to have a proper goal in place. If you’re solely striving to achieve brand awareness and visibility, your target will be influencers with a massive following in the relevant industry. On the other hand, if you’re planning to boost engagement, you might want to target micro-influencers. 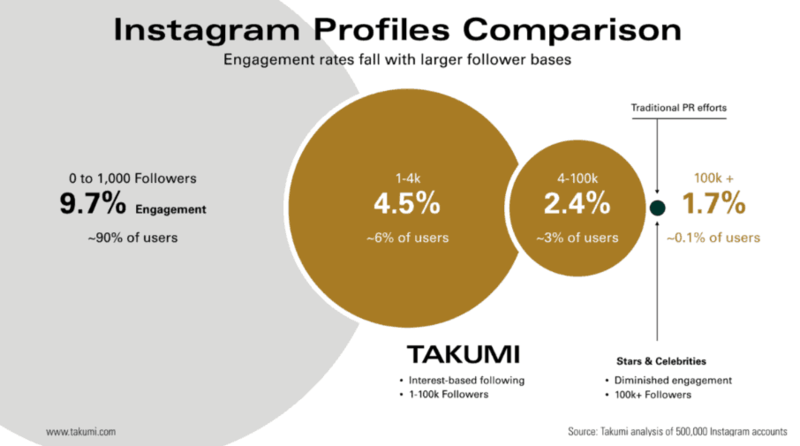 These social media influencers may not have millions of followers but they have a much higher engagement rate with loyal followers who look to them for product recommendations. With the right influencer marketing platform, you should be able to study the number of followers and level of engagement different social media influencers have been able to garner. This influencer marketing platform should also be able to help you conduct thorough research on the influencer and see if their content and messaging aligns with your brand values. For instance, social media influencers with fun and creative content may be ideal if you wish to promote your laid-back attitude. Influencer outreach emails are a lot like email marketing to potential customers. You’re basically selling your brand and your partnership to the influencer whereas with email marketing, you’re selling products to consumers. But when it comes to influencer outreach, sending out a cold outreach email isn’t always recommended. It may work in some cases but it’s ideal to play it safe and begin with an initial connection through social media or industry events before you send them an email marketing your partnership. You’re dealing with a group of smart individuals who have plenty of outreach emails coming in every day. If an email comes from a name they recognize, there’s a much better chance of having them open the email. There’s also a much better chance of them being responsive to the email. So you need to wait a bit before you immediately start sending out outreach emails to social media influencers you discovered through an influencer marketing platform. There are plenty of ways to initiate a connection with an influencer before you send them an email marketing your offer. You can share their posts and mention them so that they know you’re sharing their content. You can comment on their posts and ask them questions relevant to the posts. You can tweet to them asking relevant questions. How you initiate the connection depends on how the influencer is most likely to notice your efforts. For example, if the influencer regularly engages with comments on their blog posts, try leaving a comment there. As mentioned earlier, however, make sure the comment is relevant. 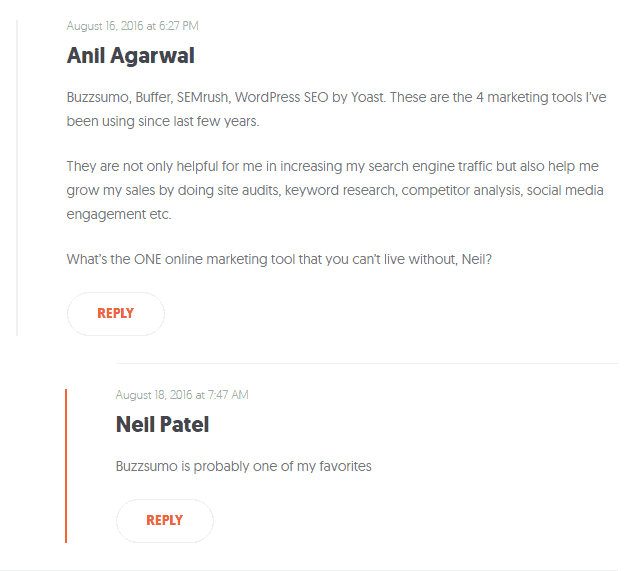 The following screenshot is from a blog post by Neil Patel on top online marketing tools. The commenter has linked “India’s top 10 Hindi blog,” which is completely irrelevant to the topic. The screenshot below, on the other hand, is an excellent example of good influencer outreach. The commenter talks about some of the online marketing and social media marketing tools he personally uses. He then proceeds to ask Neil about the one online marketing tool that he can’t live without. Neil even replied to the comment, showing that he acknowledged the commenter’s outreach effort. When you’re sending out email marketing to an influencer, you need to be as honest and direct as possible. If you’re seeking a partnership, make sure you let them know that instead of beating around the bush. Social media influencers get hundreds of marketing and outreach emails, meaning they won’t have time for people with a hidden agenda. As your email subject line is the first thing the influencer is going to see, you need to make it as compelling as possible. You may have previously used clickbait subject lines in your email marketing, but you will need to get straight to the point with influencers. They appreciate honesty and if you make a good impression right from the start, you have a much better chance of having them accept your offer. For example, your email subject line could be something like, “Let’s talk partnership?” This is short but it gets straight to the point. The recipient will know what the email contains and they’re not being tricked into opening it. And you’re ending it with a question mark, which tells them that they’re in control and you’re not forcing anything on them. Give the influencer a reason to care about your offer. This isn’t about the incentives you offer; but more about what you offer in terms of reputation. Why would they want to associate themselves with you? 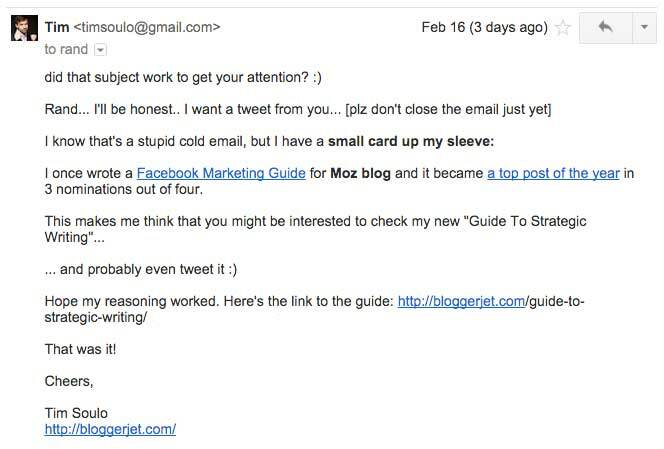 Remember, you are sending out an email marketing yourself to the influencer. So what are your benefits and your features? It could be that you’ve won a coveted award or you’ve been featured in a reputable magazine. Whatever it may be, take the time to mention that just to show the value of working with you. Why is this so important? Let’s say you’re a social media influencer. You’re approached by a fairly unknown brand regarding a partnership. They offer you some impressive incentives in the form of cash payments. But you will have to think about how partnering with the brand would benefit you as an influencer. What if the brand receives lots of bad reviews and your followers eventually find out that you partnered with a brand that doesn’t really live up to its promises? Here’s a great example of establishing credibility from Tim Soulo of Bloggerjet. See how he talked about a guide that he wrote for the Moz blog, which then became a top post of the year. That’s an excellent way to showcase your value when sending out an email marketing yourself to an influencer. Here, you’re answering the question by telling them what’s in it for their fans. This is just as useful, even if you’re not directly telling the influencer how they themselves can benefit. They know that satisfying their followers is crucial for them. So when you tell them how their followers would benefit from the offer, you’re indirectly showing them how the offer benefits them. One of the most popular online and social media marketing tools, BuzzSumo can be effectively used to research trending content. But it is also an effective influencer marketing platform that lets you conduct thorough research about potential influencers. You just need to conduct a search using a relevant keyword and that will turn up results for some of the top influencers in that niche. As you can see in the screenshot below, the tool lets you see the page authority and domain authority. The influencer marketing platform gives you proper insight into the number of followers each influencer has, their retweet ratio, reply ratio, and more. 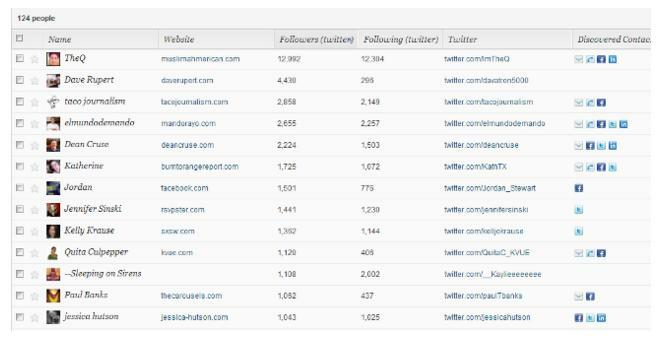 This is a highly effective tool for understanding the extent of their reach and their engagement rate. You can easily gain access to the kind of links the influencer has shared, which makes it easier for you to understand what type of content they’re interested in. Through this influencer marketing platform, you can also “Save Influencer,” so you can conduct more thorough research and then reach out to them later on. 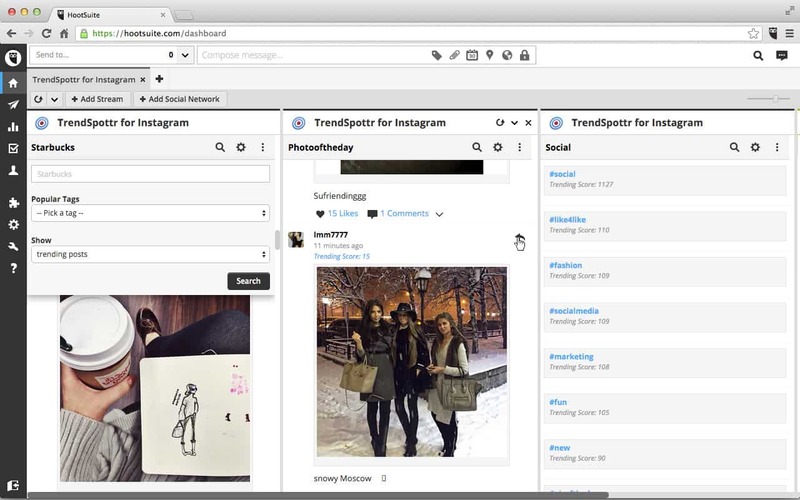 TrendSpottr is a Hootsuite tool that can help you find top influencers and top trends in your industry on Instagram. This is an ideal influencer marketing platform for those who wish to launch an Instagram marketing campaign with influencers. Through this tool, you can conduct research on specific topics and hashtags to find out trending photos and videos. So this influencer marketing platform serves as an excellent way to discover social media influencers who have a knack for producing viral content in your niche. Traackr is another useful influencer marketing platform for research. 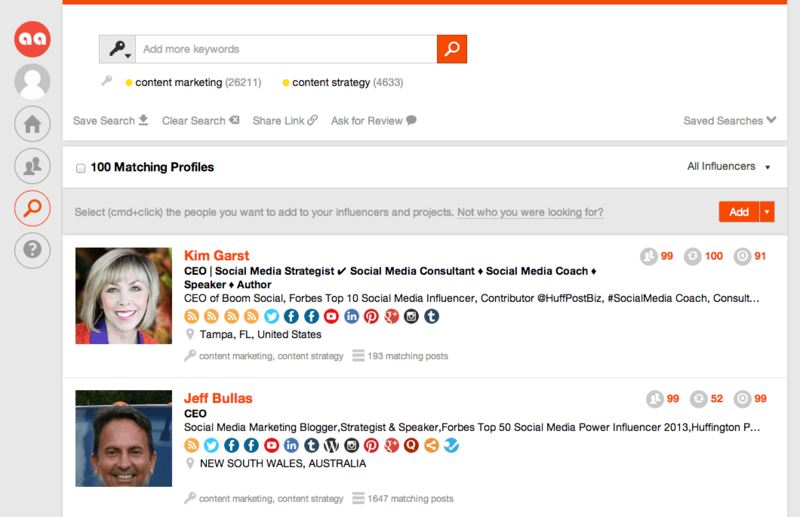 This tool lets you use multiple keywords to conduct a search on influencers and gives you a list of influencers based on their rank. This influencer marketing platform also ranks these influencers based on their reach, relevance, and resonance; which means you won’t have to go through the trouble yourself. 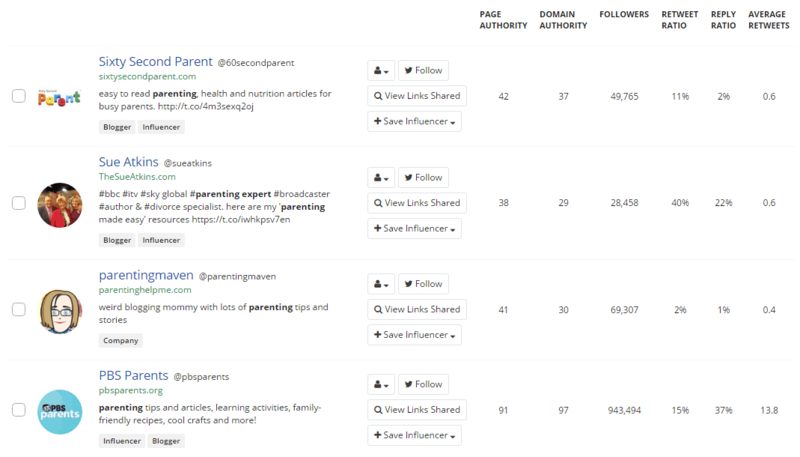 As you can see in the following screenshot, the influencer marketing platform gives you thorough insight into who those influencers are. It gives you easy links to access their social media profiles and also gives you the number of posts matching the keyword you’ve used. When you’re planning to send outreach emails to influencers, you will need the email addresses of those influencers. While many social media influencers have their email addresses displayed on their blogs or social media accounts, you may need to use an influencer marketing platform in some cases. Email Hunter is a tool that lets you find the email addresses of different influencers if you know their website or company name. All you need to do is enter a domain name and the influencer marketing platform will display all available email addresses under that domain name. The following screenshot shows an example of the email addresses that turn up in a search for Moz.com. Another useful outreach tool is BuzzStream, a comprehensive influencer outreach platform that helps you manage your outreach efforts more efficiently. Using this tool, you can discover the contact information and social profiles of influencers as well as determine their site metrics easily. So it can be used for conducting influencer research like BuzzSumo and Traackr. This tool can be considered one of the best social media marketing tools as it helps you keep track of your communications with influencers more easily. For instance, it automatically saves the emails and tweets you send out. You can also set follow-up reminders through this influencer outreach platform. So your outreach campaign remains organized and you won’t have to lose track of an ongoing campaign. You now have some of the most useful tips and social media marketing tools that you can use for your influencer outreach campaign. If you’re new to influencer marketing, you may still have some doubts about crafting an email marketing your offer and partnership. Let’s take a look at some useful influencer outreach templates that you can use when reaching out to influencers. Great job with (latest achievement or blog post)! My name is XYZ from ABC and we send out special care packages to people who are far away from home. From college students to young entrepreneurs, we help them receive a little piece of home through these care packages. We’ve even been featured in (publication, newspaper, etc.)! You often write about your experiences as a small-town girl in a big city and we think one of our care packages is sure to make you feel right at home. Would you mind giving it a try? Just let us know and we could arrange for a free six-month subscription customized just for you. In this influencer email marketing template, you’ll be starting off with a short sentence congratulating the influencer about something they’ve recently achieved. It could also be a simple praise for their latest update. You then move on to an introduction and tell them a bit about your company and what you do. For establishing credibility, you tell them that your product has been featured in a certain publication. Just make sure you actually did get featured and provide a link to the article. You continue the influencer email marketing pitch with a statement showing that you did your research about them and you’ve read their posts. And then you tell them how your product could be of benefit to them. It’s important to make the influencer feel like they’re in control of the situation so you ask them a question if they’re interested. Avoid saying something like “we’re going to send you…” because it seems like you’re not asking for their permission. My name is XYZ and I’m from ABC Corp. We’re thrilled to announce our latest product – JKL – a tool that lets you (benefit). I know you don’t normally do product recommendations or reviews, but you may want to check this tool out because it could be of great benefit to your audience. In fact, (website, influencer, publication) has given JKL excellent reviews and ranked it among the top tools for (target users). If you’re interested in checking it out, I can provide you with free access ASAP. Let’s arrange a meeting when you’re free so we can further discuss this. Now in this template, you’ll be starting off with an introduction. You continue with a short description of your new product. After this, you show the influencer that you know how they feel about doing product reviews and recommendations. But you’re only approaching them because the tool is really of value to the influencer’s audience. You also establish your credibility by showing them the kind of reviews and praise the tool has received. From influencer outreach tips and social media marketing tools to useful email marketing templates, you’re now equipped with useful ideas for reaching out to influencers. You understand what to do and what not to do when interacting with and connecting with influencers. You also have a clear idea what kind of influencers to look out for using the right influencer marketing platform. You even have some of the best choices in social media marketing tools that can assist you with influencer research and outreach. In the last part of the post, you got an email marketing framework that you can use for creating effective influencer outreach templates for your own campaign. Now you can successfully reach out to influencers by following these tips and making the most of the ideas provided here. Remember that for your influencer marketing to be successful, you need to do your influencer outreach right. And if you are looking for an experienced team to help you with your influencer campaign, we are here to help. Don’t forget to leave your comment below.